I subscribe to BETTER LIFE COACHING BLOG BY DARREN POKE! I love getting and reading his blogs. Here is todays that I thought I would share with my own readers. It is something I can relate to as being a mother of four boys. 🙂 As I have watched my boys become men, we tried to instill these same values in our sons and hope you do the same with your children. Please read! Being a dad is one of the biggest challenges of my life. I have three awesome kids, Hayden (aged 8), Madison and Logan (both aged 5) and raising them to become adults who are able to confidently make a positive contribution to society isn’t always easy. They didn’t come with a manual and whilst I want to be the best dad I can be, I know that I fall short of my own expectations far too often. The idea is that when I focus on the short-term, I can become reactive and make decisions that suit me at the time. But when I think about the long-term consequences, I discipline them better, give them more attention and help them to become better people. That they are loved – Karen and I don’t want our children to ever doubt that they are loved. We tell them every chance that we get and try to find meaningful ways to show them. They may make mistakes and we may disagree with their decisions, but we will always love and value them. As they get older, learning their love languages will help us in this challenge. The value of hard work – Life wasn’t meant to be easy and I want my kids to know that there is value and meaning in work. Will Smith tells the story of his father getting Will and his brother to build brick walls during their school holidays to keep them busy and give them a work ethic. That may be a little extreme (and we don’t need a brick wall), but I want them to know that anything worth having is worth sweating for. How to persist through challenges – I don’t want to raise quitters, I want to raise fighters. I want to show them how to overcome the inevitable challenges that will come across their path, not just give up. Needless to say, the Donkey in the Well story has already been used a couple of times and they’ll know it well by the time they’re 25. Good eating habits – With a dramatic rise in childhood obesity in Australia and the long-term health consequences associated with it, we have a responsibility to teach our kids good eating habits. Teaching good eating habits is also about teaching them about delayed gratification. It’s about making sure that they understand that whilst junk food tastes good for a moment, there are negative consequences if they keep doing the wrong thing. They may not appreciate it now, but they’ll thank us in the years to come. Kindness towards the less fortunate – This is a value that Karen and I hold dear and I want my kids to understand how fortunate they are. As a family, we sponsor a child in Indonesia and want them to be grateful for what they have and generous towards those who have very little. How to encourage others – This is another important value for our family and I would love for them to become natural encouragers who build each other up and identify the good in others. 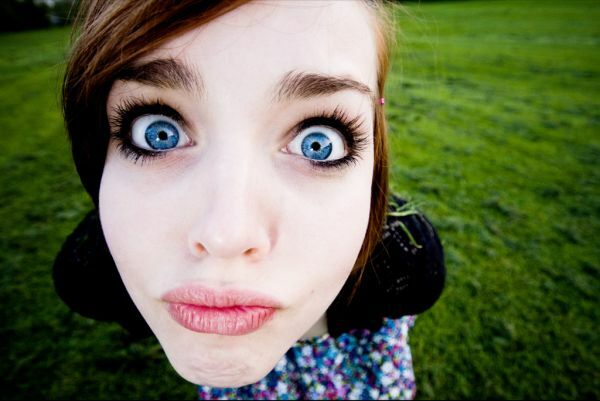 Not to take themselves too seriously – Life’s too short to live with a constant sneer. I hope that I can teach my kids how to laugh at life at themselves and occasionally, even at me. Whilst I want them to be able to work hard, I also hope that they can find great joy in music, art, sport or other interests. How to work where they are passionate – They will each work for approximately 100,000 hours during their lives and we would love it if they could find careers that they loved. I have no idea what that looks like yet (although Hayden aspires to be a zoologist), but hopefully we can help them to find purpose and meaning through doing work that they can get passionate about. Good manners – It’s not that hard to say please, thanks and excuse me. It’s not that hard to be considerate of others’ feelings. Hopefully, we can role-model good manners and help them to understand the importance of being polite. The grace of God – My faith is a huge part of my life and I pray that my kids would know that not only are they loved by their imperfect parents, but they are loved by their perfect creator. 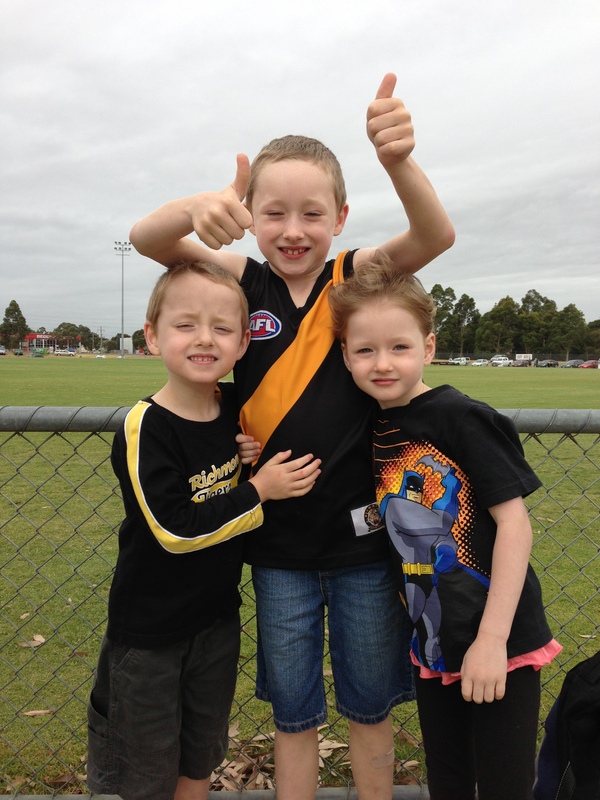 This isn’t an exhaustive list and there are other things that I would want them to know (supporting the Richmond Football Club is not negotiable), but they are my top priorities and by keeping them in mind as I parent, I pray that I can make decisions that will help them when they’re older. What values do you want for your kids when they’re older? I am not always a positive person but I am learning and it has been a process. My husband who is rarely down is always positive and upbeat. I on the other hand am learning to train myself. For instance I teach either in marriage or individual counseling, that when things look really bad and you are about to explode, what is the one positive you can pull out of the mess. I then say “Thank You God” for that particular thing. When a parent comes to me complaining about their teen child not keeping their room clean, I tell them that instead of yelling and screaming to clean up, try positive reinforcement. This is seeing the “one” thing they did do and praise them for it. I think we get in a habit and teach our children to look at the negative and be negative when we focus on the negative and teach from the negative point. I know frustration comes from focusing on what you cannot control or what you cannot understand or know. Most of the time it is all three bound into one dart from the enemy. Being productive and staying positive leads to achievement which comes from focusing on all the useful and valuable things you CAN do. Why do we as Christians, who know better, allow Satan to bombard our thoughts into the negative to create chaos, bad moods and stinking thinking? We must renew our mind daily with God’s word and train ourselves to be positive. Our focus needs to be Godly, righteous, holy, pure and the things God wants us to think. Resentment comes from seeing yourself as a victim. Bitterness creeps in because you feel like you have been treated wrongly, but if you are positive, effectiveness comes from stepping up and taking responsibility which isn’t always easy to do when change is involved. I find myself in the pit at times feeling bitter or unhappy in relationships, but now I stop the negative thoughts and reroute my thinking. This is a learned process and it has taken me years of correction. Many people say they can change but when it comes down to it, excuses are made therefore it is easier to be the victim to focus on self and the negative. If we constantly complain that life is unfair (and we all have said that), you’ll blind yourself to the best opportunities. Why? It is because of the focus on the negative. We must accept life as a journey of good things and bad and know we cannot control the past or even hold on to it to bring revenge or deserved reward . We must be balanced! Being positive means you’ll find a way to make the most of it regardless of how we feel or what emotions are tied to it. We shouldn’t waste our time arguing and fighting or focusing on the past or with the things in life. Instead, we should invest our time and resources in inspiring and encouraging others and to be the best. We should all be mentors and be an example of true life Christians. There is good, positive, fulfilling value to be lived every day, in any situation. Choose to be the person who shines a light on that potential value and who brings that value fully to life. Learn to let go of the frustration, resentment and despair by letting the positive possibilities be imparted into your thinking. Learn to let the Spirit of God fill you with the power and His strength. We cannot rely on our own strength to do this life, for if we do we live in fear and we fail miserably. I choose to see the positive. Family meetings are all so interesting. I remember we had them right before school started as we lined the boys up on the couch. Going over rules and behaving right and getting good grades, however they didn’t always follow what mom and dad insisted on. As we were all together this holiday time, Jeff, Lyle and I sat around the kitchen table discussing what we could do as a family for our goals. Even though Bryson, Jordan and Spencer were not present, they from time to time came into the kitchen to impart their ideas. Based on Zig Ziglar and Dave Ramsey, we put our goals down on paper. There are 7 different areas to work on as a family. Of course we all have our own individual goals but these were strictly for the family. 1. Career and Ministry: Continue to train people in helping them move forward in their relationship with God. What values can we give to others that have been naturally been given to others that follow us? Dedication, Hunger, Passion, Commitment, Excellence in Ministry, Marketplace. We develop as a family as we our to enhance creativity, character and hold classes for developmental programs, bible college, Leaders Advance Conference, church staff meetings etc. Our mission this year is to start a family blog in social media where each one of us will post twice a month. This will include video or wording and we will all participate as administrators. 2. Financial: Support and give to missions. We have chosen 2 missionaries we know personally. We as a family will give $15 each, a month to total more than over $500 each for the year. These two women missionaries have our same vision, work diligently for the Kingdom and remarkably teach others to love Jesus to the fullest with a humble spirit. The continue to work to bless others, so we in turn will sow into their mission. This may not seem like much but each family member will do their best to give to causes we are not directly related to. I am going to make a box to put the money in. 3. Spiritual: We as a family will read the Bible Daily Plan so that we will all read the Bible through within one year. We also plan to fast for 6 days as a family. Attend Bible College classes and have Family Home Group once a quarter. 5. Intellectual: Read 2 Books. We will have discussions throughout the year pertaining to the books and at family meetings. 6. Family: Once a quarter family meeting to discuss personal goals, successes as well as motivational structure. Holding each other accountable and staying positive, encouraging one another through texting, phone calls etc. 7. Social: The Family blog and attend events as a family during the year. The Wheel of Life is a way of showing us how we need to distribute our time, our focus, and where we need to set goals. Most of us can focus heavily in one or a few areas. The issue with that is we leave the others unattended. When we do that, we miss out on important areas of life. If we spend too much time in a certain area, our wheel is out of round. If we don’t spend anytime in some areas, our wheel is flat. 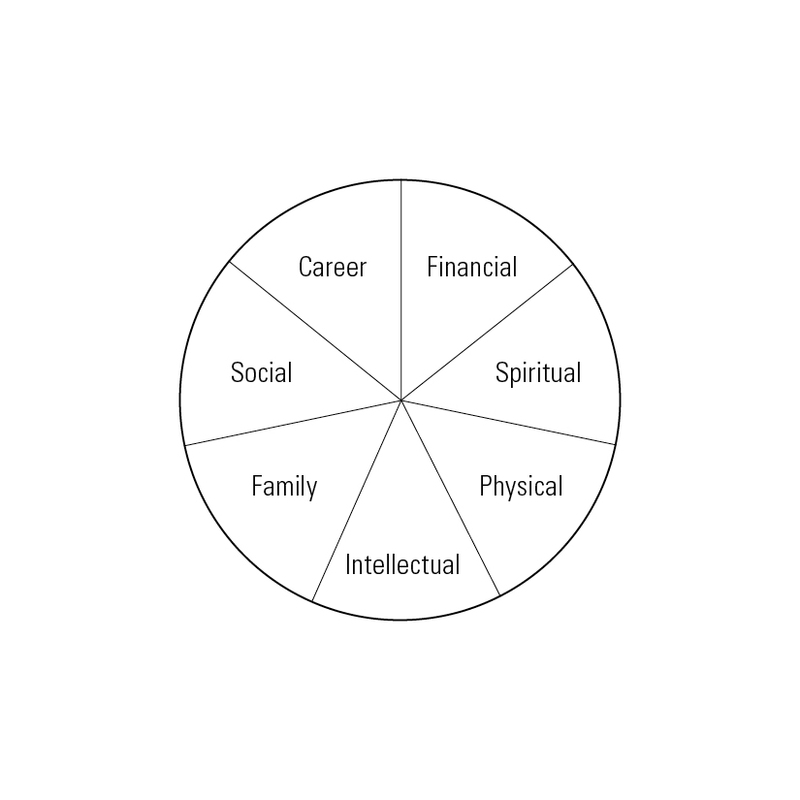 As you look at the wheel, note what areas you’re strong in, but really take a hard look at the areas where you suffer. Here is where you need to start paying attention. If you do a great job with the career, but you suffer in the social, you’ll have a very stress filled boring life. If you knock it out of the park intellectually, but you don’t focus on your family, there won’t be much of one some day. Well now you have it! I hope that in some way I have encouraged you to do the same with your family! Mine is on paper and in this blog so I can time to time go back and make sure we are staying on track. If you don’t set goals then you never reach them. I was reading the first chapter of Galatians and as I was reading I felt the Spirit of God really move upon my heart in keeping my focus and staying on track. As Paul was writing to a group of people who had somewhat strayed away from either doctrinal teaching or living a holy lifestyle. So many times we set up idols in our lives without even realizing it. Of course we don’t actually make graven images and set them up in our house and bow down and worship them but what we do is put things of life before God. We stay conscience of God yet many times we spend more time in front of a computer, television, our job, addictions or other things that consume our time. I’ve have been guilty! It’s a way the enemy can make us lose focus in a subtle way. Then when we are feeling the effects of bad mood, children acting up, marriage falling apart or any other chaotic whirlwind we tend to blame other people for our crazy world. Many times people then seem to wake up and run back into His arms and dive in giving God 110% or they run in the other direction in a downward spiral. Running never solves the problem. Although there may be a temporary fix of feelings when there is a change maybe in churches, living quarters or jobs the behavior patterns often surface again because of heart issues. Out heart needs to be focused on loving God in a way where He comes first in our lives, in our marriage and in our family. I have seen a many of families that put such an emphasis on sports in their children’s lives it becomes a second God in their household. Now before you judge me with that statement let me tell you of our experience. All our boys played sports and there is nothing wrong with that. However what I believe was wrong is that we made such an issue with using sports as such importance in life when it wasn’t. Don’t get me wrong, sports teaches children many aspects of life, keeping them healthy, promotes self-esteem, goal setting, teamwork and how to deal with adversity, however it shouldn’t be such as an emphasis that it requires more time or takes time away from God. More and more I see where teams are requiring church service times as either a practice or game time. This included traveling on Sundays.We refused to follow this and kindly told the coach that we couldn’t abide by this schedule. Usually the coach was very understanding. Could this be a distraction in our family values of importance? Some say it is only for a season and it won’t hurt missing a few Sundays but when you miss it is much easier to miss again and again without motivation to return to the regular routine of family Sunday worship. We justified all this by stating we were having family time and yes we spent thousands of dollars in uniforms, fees, games and traveling. Of the entire school years we spent more money on sports than what the average Christian gives yearly in tithes. My point is most people are willing to give to the now satisfaction for their children rather than investing into the Kingdom where eternity is the factor for all generations. Lyle later told us he felt stressed out, much pressure from the games and felt as though he had to please his dad instead of enjoying the games. We were clueless. All the money, all the time spent was not good enough to prevent Lyle developing habits of a lifestyle of running from God in his teens. Basketball was his God. This idol was what he had a relationship with, not God. He had the knowledge of God, Jesus and the Holy Spirit but he didn’t have a tangible relationship with them. Basketball was practiced almost seven days a week, God only twice. I hope you get my point. 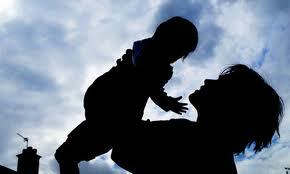 Children may not always learn what the parent teaches but what the parent allows to be practiced! Jeff and I were talking about how many people want God to come in and fix their problems and make their pain go away yet they are unwilling to have a heart or behavior pattern change. Blame games comes into full force in this. Who do we blame? We tend to blame those we are close to, or to those we rarely see that may have hurt are feelings or haven’t shown us much attention in which we demanded of them. It is easy to point fingers instead of change our family values, our heart or give God the 110%. This is where idols surface. If you find yourself giving more time to other things than thinking or thanking God, then look for idols in your life. If you are getting negative and more negative with life, then idols are present. If you are living from chaos to chaos and your household is crazy without any peace, there are idols. Don’t be fooled by the enemy and don’t fool yourself. Ask God to take blinders off your eyes and expose the enemies tactics. Start giving God your all and watch the idols crumble. I remember the times when I thought I was losing my mind in trying to deal with four boys all within 7 years apart. I tell the truth when I say my twenties were a blur. I walked around sleep deprived, felt like a slave being used and whipped into subjection of being a submissive wife. I was pulled from every direction with the boys, church, spouse and demands of the chores. We lived in a small home with a sagging floor in the kitchen, with the washing machine on one side and the dryer on the other side but however I was thankful to have those doing at least four loads a day. The two bedroom house only had 6 rooms with three closets and a floor grate heater that the boys would fall on time to time and leave burnt waffle marks on their little hands or feet. I remember begging my husband to move or praying God to give us a bigger house. It was there in that home we started in ministry. From being part in teaching during Sunday School, home prayer meetings and bible studies, to youth directors and ladies auxiliary my involvement was crucial to my survival. My tears that flowed sitting in the ladies bathroom wrestling with the boys seemed endless and at times I thought I should have just stayed at home and watched preaching on TV. My purse, along with large bag containing snacks, water, cars and trucks to pacify the boys during preaching didn’t always suffice. I felt as though I was so mean in making them sit still and popping them on the leg or taking them to the bathroom as they screamed “No mommy don’t whip me” while people chuckled and the older generation smiled and said, that’s right whip your kid. During that time there was no such thing as a nursery or someone else watching your child for you. However, the long haul of sticking it out and come hell or high water they were going to church. What little I heard was enough to keep me hungry for more at times and at other times I made myself pack up and relive the nightmare. What little worship I got to participate in saved me from more emotional breakdowns that I had time to time. What little knowledge I gained from the studies and what little time I got with the girlfriends was enough to keep me “stable”. Most of my high school friends were already getting divorced and getting remarried or had moved away so I turned toward the church. There I found solitude, peace and joy. I could get my fix of somewhat a jolt of the Holy Ghost by letting out a war hoop or jumping up and down on the devil to keep me from wandering from my calling of wife, mother and Christian. You see I was raised to be very independent so for me to know the role of a wife, a Christian one at that took even a big demand on my part and that was change. I did much soul-searching and changing in my twenties. I really didn’t feel loved because love was only superficial at the time, I only felt used. I know now what I was experiencing is trying to find myself, my own identity wrapped up in things. I was a stay home mom, feeling used and trapped into mommy mode with no light at the end of the tunnel. I didn’t appreciate motherhood as much as I wished I would had. I loved the children, don’t get me wrong and in fact it seems as though I cannot escape the calling back into children ministry. In High School I believed I would be a Pediatrician but I didn’t want to put the school hours in because I would be “old” in my late twenties. I laugh at that statement now. I tell young mothers now, their ministry is their children, pour your life into them because they will grow up one day and need a good strong foundation. With our oldest I demanded so much from him after I had my second child. I look back now feeling guilty at times and think how mean I must have been demanding him to grow up when all he needed was just to be loved and held cause his younger brothers got all the attention. That is why he was so partial to Granny because she let him sit in her lap and feed him even when he was six. If I could go back, would I have changed some things? You bet but we cannot go back or even think about the regrets or that would put me in such a depressed funk I would just sit around and cry all day thinking how bad of a parent I was. Life in my twenties can I be honest, it sucked and I know that may seem like a harsh word but it is the truth. My body was no longer a 5’4″ 104 pound hottie but a mommy making baby producing machine, robot full of at times, resentment toward my husband for making me fit into his schedule. I loved being pregnant however I didn’t like my body changing. Never would I want to live that over again. I focused on at times what my needs were and how they wasn’t getting met instead of meeting the emotional needs of my children. My husband needs were always taken care of so I think that’s were the resentment came from. I felt as though he never helped with the children, much less dress, bathe or feed them but he did however come home to vacuum under one of my meltdowns. He proceeded to help with this chore from that time on. We struggled financially, struggled to love each other and trust each other. We tried to leave our past behind us, tried to look forward to a future of hope and promises. I think back and what I did treasure was the closeness of my babies. I think about the good times. I think about them rolling the cars up and down my legs and feet while I read or studied. I think about the many times we played in the back yard with the sprinkler or jumped on the trampoline together. I think about curling up next to them and taking a nap together, making sandwiches for lunch or the usual mac-n-cheese, the oatmeal or cereal for breakfast or the home-made popsicle. I let them jump on the bed, play hide and seek in the closets and play with play dough. I liked being a fun mommy. Those were innocent times where we were all changing. Changing into what God wanted us to become. Giving us memories that one day would shape our lives. Getting us prepared for a life of ministry, but with the calling comes many hurts. Hurts that only a mommy can feel when their child is hurting as they grow into adults and trying to find their own way. Hurts that lie dormant and are only revealed for a time of healing. Wounds that were once secrets which seem to explode now that makes me question my parenting skills. I tell my boys now, we parented the best we knew how. We wasn’t always great but we did our best for what we knew at the time. Life is life, life is not fair and life has its good times and its worst times. There are times of struggle and times of pain but it is through all the crap that makes us persevere into the man or woman God wants us to be. I hate feeling like I failed as a parent and wish I could have protected them even the more so from the ugliness of this world. I cannot think or either fathom the reason why but only the hope that lies within this world of pain to reach others. Writing this blog helps in the healing process as tears flow down my cheeks hoping someone will read and feel loved during this time in their “mommy mode”. So, if you are a parent in your twenties, maybe you can relate to my pain and my treasures, the mixed emotional basket full of craziness. It is only a season. Do your best, take time for your spouse and time for yourself. Don’t beat yourself up when things don’t go right or you don’t feel appreciated or you don’t get any help from any body. Times like those change us. God has a way for us to depend upon Him and not ourselves or others. He was the one who helped me survive all the seasons and I am confident that He will continue to help and guide me as I am in my other seasons. Through it all I quoted, Train up a child in the way they should go and they will never depart from it, I can do all things through Christ which strengthens me and Jesus said, I will not leave you or forsake you. These three Scriptures kept me going, were my strength and my hope during my twenties. Just a random collection of thoughts. So instead of keeping them to myself, I figured I’d post them here, just for fun. I have things just floating around in my head which sometimes I want to say but don’t ….so here you go. It’s totally okay to change your mind. Several times. Just hang your clothes back up instead of throwing them on the floor. Don’t always think something is right because a good point was made, look from another perspective by wearing the shoes of the person you may be talking about. Forgiveness sometimes is quick and sometimes is a process, however there is nothing to hard to forgive, nothing. Have an argument with your teens is always hard, but end it with I love you. Regarding family or close friends, always end a good-bye – with a “love you” whether you are on the phone or in person, it may be your last time to say it. Kid time you don’t get back. Treasure each season of life. Your children become replica’s of you! Parents need their kids, too. Feel young again, learn to giggle. The world will not stop if you get off Twitter or fb for a day or two. I hate cleaning toilets and despise potty mouths. Your sin will always find you out, even when you try to justify it or think you are right. Stop and rethink what you say, do or post online or it may come back to bite you. Learning the 5 love languages is the best thing you can do for any relationship. You can find inspiration and motivation in curious places if you’re willing to look for it, and accept it when you find it. Let go of the truly toxic and negative people in your world, whether they be close in your personal lives. Life is way too short to let other people take your energy from you. I call them VDPs – very draining people. Change can be terrifying, overwhelming, and even sad. And yet, it’s the thing that carries us to whatever amazing thing is next. And there is always a next, amazing thing. Don’t grieve change, just do it. I love my gals who I hang out with and how very special it is to find people who you connect with, can laugh with, and who love you no matter the level of crazy. True friends work through any circumstance. If you have a cold you are not dying so don’t act like it. Make yourself get up and push excellence. The appearance of confidence and conviction is not always rooted in same. Often, it can be quite the opposite. Don’t puke on others, no one wants to hear your opinion or advice unless asked. Strongholds are consuming thoughts of hitting the replay button over and over again. Learn to let it go and throw the tape player out the window. Don’t be a handicap pregnant woman, live lively with the fruit in your womb. An overflowing inbox, not sleeping, and forgetting to eat are not badges of honor. They are signs that you really need to do something differently. Having an idea is easy. Having the courage to defend, pursue, develop, change, and realize that idea is where you prove whether you’re for real. Step outside your comfort box. When you fall down, you can get back up only if you want to. When you answer a phone don’t answer with a tone of voice like you are dead, sick or depressed, I like cheerful greetings. When you leave a place, leave it better than you found it. Don’t trash it during or after or you will regret it and you may reap the benefits. My daddy taught me this. You’ve probably inspired someone lately that you didn’t realize was paying attention, this includes your children. Almost anything can be solved with a hot bath, a good book, and a prayer, or the best cry to Jesus. I need to work on giving mercy, my listening skills and my discipline. I wish I had a dollar for every time my husband said, “You need to exercise”. I would be wealthy. You will be known by your fruit – good and bad. You are not who you think you are, you are not who people think you are but you are who God thinks you are. The best way to support your pastor is be hungry and want to learn. Nothing is more heartbreaking than a sheep who doesn’t want to learn or change unless it is sheep that choose to bite and leave the flock. Don’t bite or you will be bitten back one day. I have learned to keep my mouth shut..hard lesson. I like to interpret my dreams. Everyone has a choice and a free will. 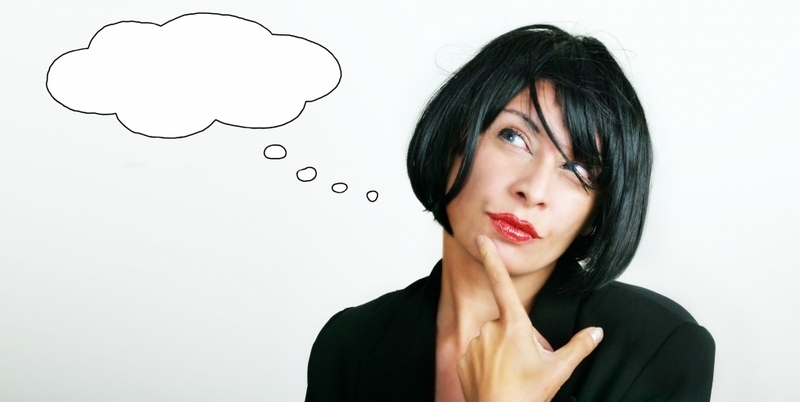 What we do with those choices and free will determines where we will be tomorrow and next year. When growing up there is nothing like your momma’s cooking. My mother always had a home cooked breakfast just about every morning, making her own biscuits most of the time and she still holds the same tradition every Sunday morning. In fact, I could go over there right now and she could whip me up what we called “a runny egg” or “fried hard egg”, gravy, sausage or bacon. Meal time was family time and I treasure the memories she created in our little minds while growing up. 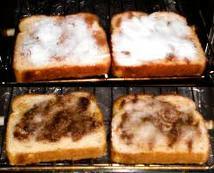 One of my favorite was her cinnamon toast, smothered with butter until it leaks through on the other side, covered with sugar and just the right amount of cinnamon, toasted in the oven just right. It can’t be too toasted or too soggy but just right and it was far from healthy. I sometimes wondered if mom was in a hurry to fix us something, or if the cupboard was bare since she fixed us just toast. I tend to think she made the best out of what she had for us kids and made it special and different from the traditional cooked meal or box of cereal. In life we can look at what we have and think it is small when we compare it to others. God doesn’t want us to compare but make the most out of what we do have. Just like mom’s cinnamon toast, we can always add special touches to our simple things, be thankful and make it sweet for others. You might not like the thought of changing or getting out of routine, but once you taste it you will never forget it. Take what you do have today and make it something special for others. Let your legacy live through your next generation, even if it is as simple as momma’s cinnamon toast. Prayer:Lord thank you for the little things! 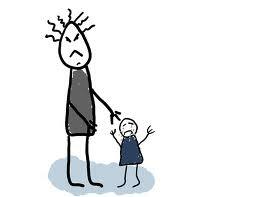 Growing up we seem as children to always want our parents proud of us and give us encouragement. My mother always told me I could be anything I wanted to and do anything I wanted to. She taught me to be self-sufficient but she also instilled in me to be a Christian and to trust in God for where He was leading me. I am so thankful for her teaching. This past week I have been swamped as usual with things to do but looked forward to seeing my number two son, Bryson on friday night. He moved to Shreveport Louisiana several weeks ago for another round of internship. I knew he would be at this gathering in which our friend pastor would be preaching, so we drove two hours to be with them. Bryson would be painting in which I just love to watch how his creative side flows out on canvas and people are just amazed. It made me think about parent/child relationship. The child wants his parents to marvel over his work and the parents love the work regardless if it was perfect or what anyone else may think. Do you remember how many coloring sheets or home-made magnets you put up on the refrigerator when they were little? God our heavenly Father is so proud of us. We are His children and He loves us regardless of how we perform, what we do, what we make or how we act. He loves us unconditionally. We want our daddy to be proud of us and I want my Heavenly Daddy to be proud of me. Paste this link in your browser and you can watch him paint! Thanks for watching! Prayer: Lord I love you with all my heart, soul, body, mind, strength. I am so thankful that you the author of creation give us the ability to be creative like you! Continue to let creativity expand within our grasp! In Jesus name. Amen. A third time he asked him, “Simon son of John, do you love me?” Peter was hurt that Jesus asked the question a third time. He said, “Lord, you know everything. You know that I love you.” Jesus said, “Then feed my sheep.